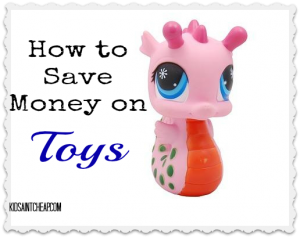 I have a young daughter and am realizing just how expensive it can be when it comes to toys. Advertisers do a great job at marketing to both parents and children in trying to convince them of what they ”need”. Most toys are not a necessity in any way. Granted, there are some really great toys/educational items we have come across that we have enjoyed but I don’t think she is any better of a toddler in terms of development because she had these toys growing up. Given that purchasing even some items will be inevitable with kids, I have gone out of my way to figure out ways to do it as cheap as possible. My first option is easier for young babies and children but if there are items you can borrow from a friend of family member save your money and do it! Most of these toys (such as exersaucers, play mats, activity tables) are indestructible and easy to clean so you don’t have to worry about ruining or spreading germs. We have a friend with a daughter who is four months older than our daughter which worked out well for sharing some baby toys. As she was getting ”too old” for the objects, we inherited them temporarily. Babies especially lose interest or grow so fast they don’t play with things for very long. Same goes for books. While we have many books purchased or gifted we also borrow a ton from the library. Makes for a fun outing and she gets ”new books” every few weeks. Younger kids especially will have no way of knowing if something was used, nor do they often care. Items we couldn’t borrow from friends we often bought through online classifieds or yard sales. Again these objects were often only played with for a very short time and resold at a fraction of the cost. A quick clean restores them to brand new conditions! If I must buy something new, I always check online (Amazon, Ebay etc) first since their prices almost always beat in-store. If I can’t find what I want online (or shipping isn’t included, I take my search back to the internet but to look at specific stores until I find the best price. If there is another store that does price match guarantee (sometimes even beating it by a few dollars) I usually try that route too. Buying New: Sale, Discount or Awards Offered Only! If we’re buying from a store, it’s a super sale or we’re getting something in return. We decided to get our daughter a specific outdoor playhouse for her upcoming birthday. Retailing around here for $300 didn’t settle well with us. For months we’ve had our eyes on online classifieds with no luck. Buying online also wasn’t an option since it was massive and was going to cost a small fortune (anywhere from $50-$100) to ship. We accepted we’d need to either change our minds on gift or buy it new. We lucked out with a 50% off sale, plus price match. We snagged the $300 playhouse for $115 (less a gift card we’ve been holding on to). We also received bonus collectors points for our purchase! I was more than happy! Even if you only get the item on a tax-free sale, saving tax is money in your pocket! Shopping around can be tedious but in my option so worth it. 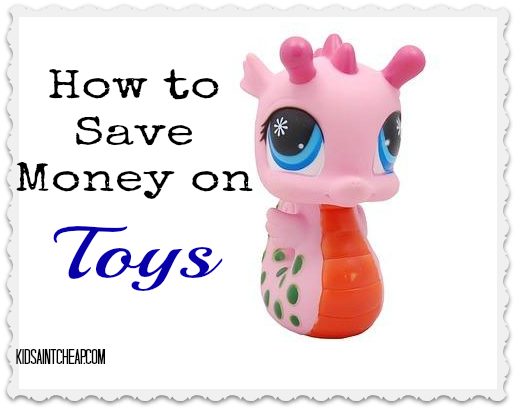 How do you save when it comes to buying kids ”toys”, other than, of course, avoiding the purchase at all? We have one kid… A daughter. My husband and I plan on having another in a couple of years so for a few things that can easily be stored, we would buy gender neutral so that we could get another use out of it when we have another baby. My daughter doesn’t care if it’s not pink… We got her a 4 in 1 Radio Flyer tricycle for her 1st birthday and bought the red one instead of pink. I’ve also purchased a few things used and then resell them, usually for the same price I bought it for. I do the same with online price comparison. I have an app where I can scan the barcode and several online and local stores come up. I use it to price match.